We recently completed a job for a beautiful Country Farm Wedding for a lovely bride and groom Sarah and Ben. Her now Husband’s father is a farmer and they owned some beautiful land and wanted to create a Wedding, to incorporate the landscape and really bring together everything and everyone that the couple loved. 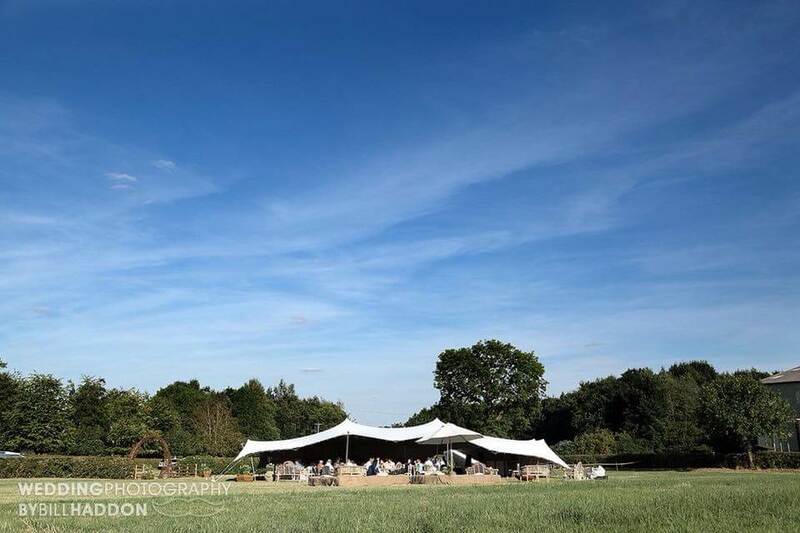 Of course our stretch tents complimented their ideas perfectly, as our beautiful white canvases are perfect for an indoor/outdoor Wedding and can be setup in such a way that would give the best views on the day. 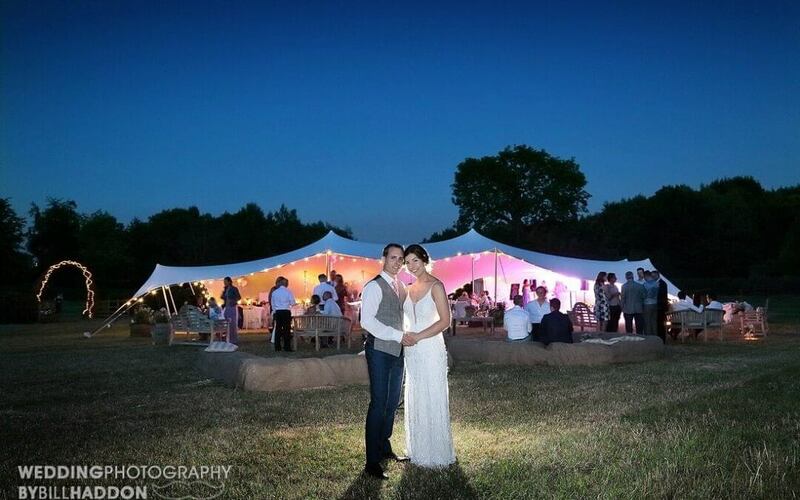 After originally quoting the couple for a 10x15m stretch tent which would have been sufficient to cover 70 guests. We then spoke to the couple and agreed that a 12x20m stretch tent would be more suitable, as the couple wished to have a buffet area, a bar and more mingling space for their guests. This just goes to show, that there can never be too big a tent for your guests. 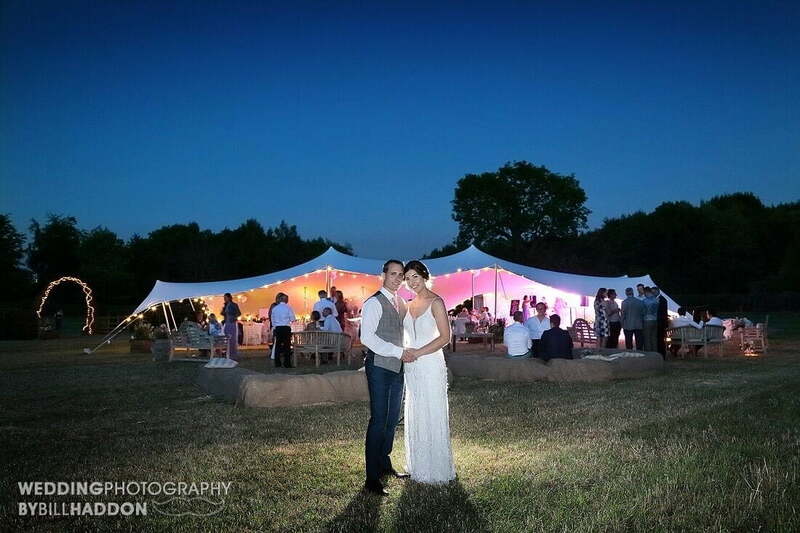 We put together a package deal with soft matted flooring, furniture, festoon lights to decorate the outside of the tent and up lights to give some mood lighting for the party later on and of course, the all-important dance floor for the couple’s first dance. From the initial enquiry in October 2017, everything was booked and the deposit secured by November, which meant the couple could relax and feel reassured that everything would be ready and set up for the Wedding the following August. It is normal for couples to have plenty of questions and change requirements throughout the process and of course we catered to this, to ensure everything ran smoothly on the day and the couple were incredibly happy with the final result. Of course you can see for yourself through the photos what a beautiful day it was for the couple and we are so very happy that we got to be a part of it. If you yourself are planning a wedding and would like some cover for your outside space/venue, please do not hesitate to contact us as we have so much experience in this field now and would love to work with you to create your own unique Wedding day!